The age-old adage “you are what you eat” loosely sums up the premise of Ayurveda. Ayurveda is a holistic approach to health based on balance—one’s diet profoundly sustains the mind and body’s equilibrium. It is also believed that in eating correctly, food can be not only medicinal but also preemptive in maintaining the body’s immunity to disease. Many spices and herbs are chronicled within the Ayurveda system as carrying with it profound health benefits which go beyond its enhancement of the flavor of food alone. Turmeric, cumin, coriander, fennel, mint, asafetida (hing), black pepper, dried powdered ginger, cardamom, cinnamon and nutmeg. Turmeric is an important spice in Ayurveda. It is ubiquitous in Ayurveda cooking. It contains the flavonoid curcumin, which is known to have anti-inflammatory properties. This all-around wonder spice helps detoxify the liver, balance cholesterol levels, fight allergies, stimulate digestion, boost immunity and enhance the complexion. It is also an antioxidant. 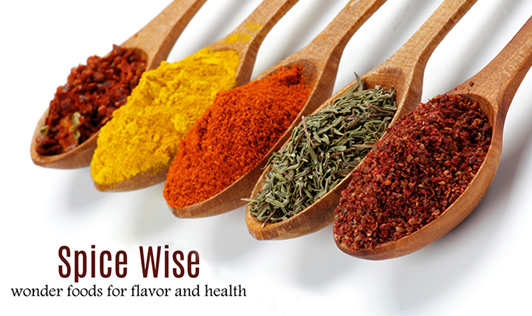 Ayurveda recognizes it as a heating spice, contributing bitter, pungent and astringent tastes. Cumin is popular in Indian, Mexican and Middle Eastern cuisines. According to Ayurveda, it is a cooling spice. It is supposed to aid digestion and help flush toxins out of the body. Cumin can be used either as whole seeds or ground, raw or dry-roasted. Ground raw, it is a dull brown color, which is enriched by being sautéed in ghee or oil. Powdered dry-roasted cumin is a rich brown in color. Both sautéing and roasting make the aroma and flavor of cumin come alive. Cumin combines well with a wide range of other spices, including turmeric, ground fennel, ground coriander, ground dry ginger and cinnamon. Fennel is another cooling spice. According to Ayurveda, fennel is extremely good for digestion. In India, eating a few fennel seeds after a meal is a common practice. Fennel seeds are sweetish in taste, and ground fennel works very well in sauces. The seeds can also be sautéed in ghee (clarified butter) and added to vegetable dishes. Cardamom clears food cravings and refreshes the palate. It destroys mucous in the stomach and upper GI. Cardamom can alleviate indigestion, gas, morning sickness, and acidity. It assists in the digestion and assimilation. Cardamom is a versatile, pleasant and aromatic spice used in beverages, main courses, and desserts, with sweets, savory dishes, and fruits. Ancient Egyptians chewed cardamom to whiten their teeth and sweeten their breath. If you are not sure how to use cardamom, try to sprinkle it in oatmeal prepared with milk or experiment with this healthy pancakes.